The start of maple sugaring season is always unpredictable and producers begin tapping based on a number of factors, but the lore says that several weeks of deep freeze are needed to ensure a good season. Some producers begin tapping in early January and some years are rewarded with an early harvest. Others tap around the same time every year based on years of experience or staunch adherence to tradition. Using traditional technology, it is a balancing act. Tap too soon and your tap holes may heal over and you’ll lose out on the bountiful late harvest. Tap too late and you may miss a good portion of the sap if it’s an abnormally early season. In my limited experience, the season is trending earlier and the data backs this up. An earlier season also means less days in the season which means less maple syrup. For those that hope to make a profit, the decision on when to tap and the waiting game can be quite nerve racking. The start of the 2016 season has been terrifying. The warm fall leading into a freakishly warm December have set off alarm bells for anyone who has been paying attention to the quickly changing climate patterns. If a December rainstorm over the North Pole or rare January hurricane (ALEX) isn’t an indicator of something drastic happening with the weather, then you may be watching too much Fox “News”. I have written about climate change and the effect on the maple industry. Listening to the voices coming out of the Paris climate talks, I was especially struck by activists from Arctic communities who count themselves among the first climate victims. Sami reindeer herders and Inuit fisher people have been seeing big changes for over a generation. The ecosystems that they are an intimate part of are disintegrating as the deer starve, the ice gets thinner and the weather gets warmer. Maple syrup is now considered an endangered food along side the likes of chocolate, honey, coffee and tuna. The season get shorter, the trees feel more and more pressure from disease and pests and the hardy northern folk that harvest the sap of maple may soon count themselves among the victims. For now, the thing to do is to maintain the tradition and hope a future that includes maple trees, sugarshacks and pancakes. We must also get in the fight. There are battles to save our climate raging in every corner of the world. Stop a pipeline, a gas storage facility, a coal power plant. And keep tapping those trees. Maple season a few weeks away! It’s hard to imagine that maple season is just a few short weeks away. Sapsquatch Sugarbush, along with most of the Northeast is completely buried under more than two feet of snow and the region is gripped by sub-zero temperatures for much of the past several weeks. In my memory, this has to be the most snow I have seen in the sugarbush and it seems that a new layer of soft powder is added on an almost daily basis. In a bit over a month, we will be hosting our annual open house on the farm during NY State Maple Weekends, March 21-22 & 28-29, 10 AM – 4 PM each day and all that powder means we are looking at possible the best sledding conditions ever seen at Sapsquatch! Despite the cold and deep snow, things are in motion. A weekly afterschool program with 10 youth from the Enfield area is going strong in its third year. Three of our 13 year-old alumni will be supervising work teams throughout the season, managing our sap buckets, measuring sap yields, and calculating syrup yields. They will receive ½ of the syrup yielded from buckets to sell at school and at Enfield’s market. 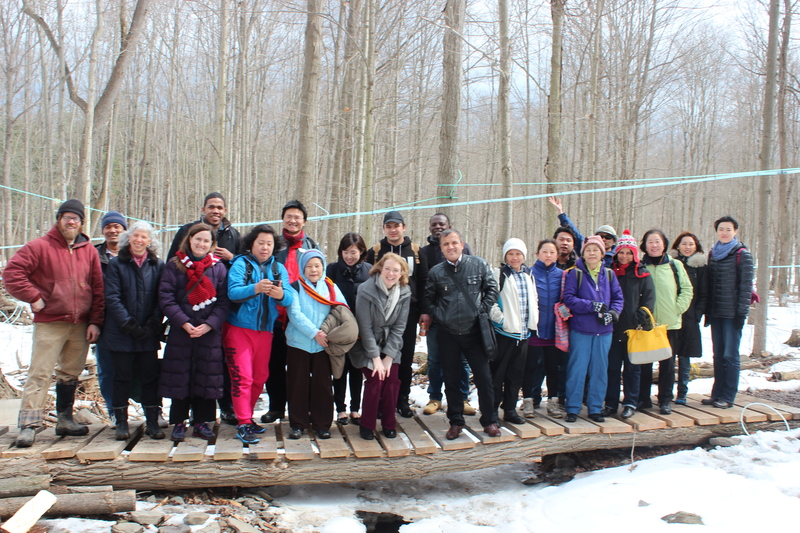 TC3 (Tompkins Cortland Community College) Farm-to-Bistro program visited the sugarshack for the first time as part of a new educational partnership. http://www.tc3.edu/catalog/ap_program.asp?dp=sustainable_farming It’s very exciting to be working with this innovative initiative which explores every aspect of the food system. An agroforestry operation like Sapsquatch represents an important part of the sustainable farming equation for our region. TC3 Farm-to-Bistro is just one of the many educational groups who will visit the farm this year. You can support this important educational work which seeks to promote awareness of the maple industry as an important sector of our local agricultural economy, please consider purchasing a full or half gallon share of the 2015 harvest. You can do so by visiting https://squareup.com/market/sapsquatchsyrup and placing a credit card order. You can also call (607) 280-8498 or email sapsquatch7@gmail.com for any questions, custom orders or alternative payment methods. On a side note, my crowdfunding campaign to raise cash to replace my stolen chainsaw was wildly successful. Thanks to all who contributed! You may or may not know that I do not live on the land where the Sapsquatch Sugarbush and my beloved sugarshack are located. I have been commuting back and forth to the farm for the last 8 years either by bus, my volvo (which met it’s demise during the final weeks of the 2014 maple season), with various volunteers and buddies. Transportation has been a perennial challenge especially when it has involved moving supplies and tools back and forth to and from the farm. My neighborhood is pretty nice compared to a lot of places I can think of. It’s less than 10 minutes walk to work and downtown, two minutes from one of the best coffee shops in the country and close to my daughters school and family. It’s not a bad neighborhood, but sometimes bad things happen. My downstairs neighbor had her car torched this last fall. that was kind of a wake up call. Our house has been robbed a few times; bikes, computer, camera, groceries, even returnables are fair game to the thieves. Heroin has been on the rise in Ithaca. It’s cheap and readily available but it’s dangerous. Last month there were three OD fatalities in 10 days when a bad batch was circulating. It’s a drug that drives people to desperation, depravity, thievery and violence. I’ve been robbed before and each time it’s been a blow and the feeling of intense violation has been present, but it’s never been something as essential as my chainsaw. I use my saw all the time at the farm cutting wood leading up to and during each maple season to feed the fire which rages within my traditional wood fired evaporator. I use it off the farm to make ends meet during the off season. I get requests all the time for chainsaw work and it’s fun, it’s good exercise and it’s easy money for me. To be robbed of this essential tool is more than a violation, it’s an attack on my very being, my livelihood, my family and my children’s well being. Sapsquatch Maple CSA shares are now on sale! This year, we are also enabling our members to purchase farm credit in advance of the season to help us purchase much needed efficiency equipment and build an addition to the shack. When you purchase your farm share, you are also supporting youth educational experiences both on and off-farm, our new young sugarmakers entrepreneurial initiative and the development of a new maple sugaring curriculum. black locust posts and hop poles. Place your order online NOW using my new online marketplace: http://mkt.com/sapsquatchsyrup or in person at this year’s Winter CSA Fair, Saturday 10/25 at Boynton Middle School. Contact me via email at sapsquatch7@gmail.com or by phone at 607-280-8498 for other payment options or with any questions regarding farm credit. 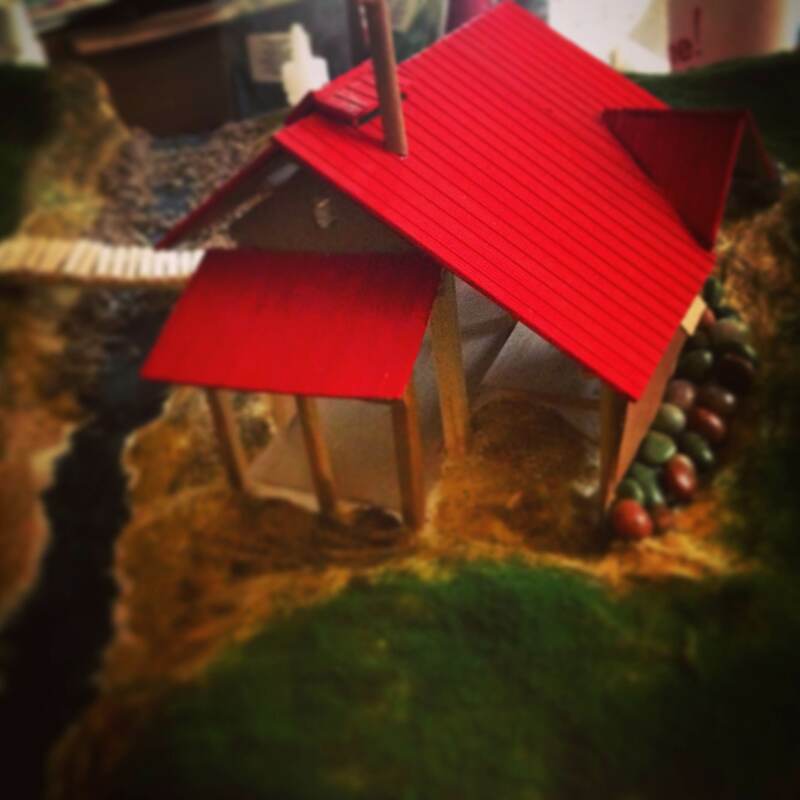 Here is a preview of the sugarshack expansion! 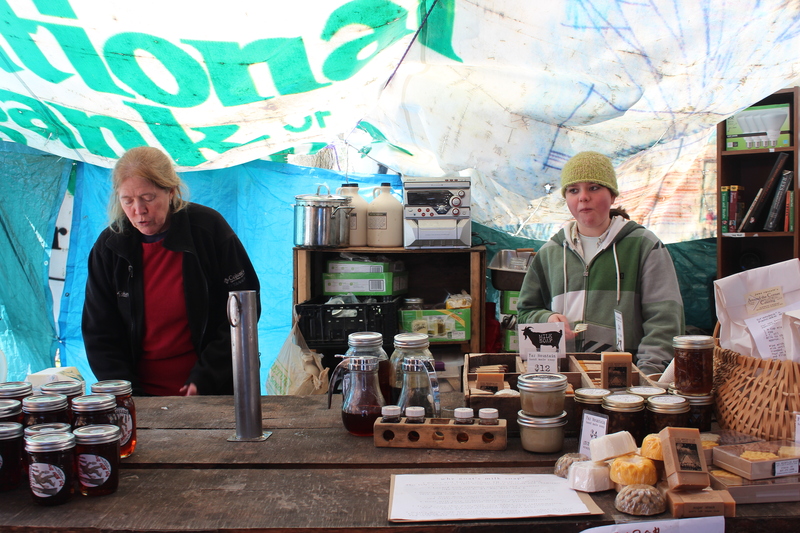 Last weekend, maple producers across the state of NY, including Sapsquatch, opened their sugarhouses to the public for two days of education, family fun and maple syrup. We were very busy from Thursday on at our Enfield sugarhouse and had a steady stream of visitors. Even bitter cold on Sunday couldn’t keep the dedicated maple lovers away! The weekend really began for me on Thursday with tours from Ithaca Waldorf followed by two groups from BOCES ESL (English as a second language) classes who have come now for 4 years. They were very excited and almost cleaned out my supply of syrup. Finally, my regular afterschool program from Enfield was joined by a second section of pre-teens. Kids from my regular program provided a tour and wood chopping demonstration for the newcomers and you could tell they were very proud of their place here at Sapsquatch. I was very happy to have a great team working with me this year. My mother Jane Russell of Around the Corner Catering http://www.aroundthecornercatering.com/provided complimentary pancakes and Sapsquatch maple sausage, maple sap brewed coffee from Keuka Coffee Roasters , and hot cocoa to guests who came to sample this years fresh maple syrup. My daughter Gaia who will be turning 12 in a few short weeks was our sales person, provided syrup samples and helped out with various other projects as throughout the weekend. 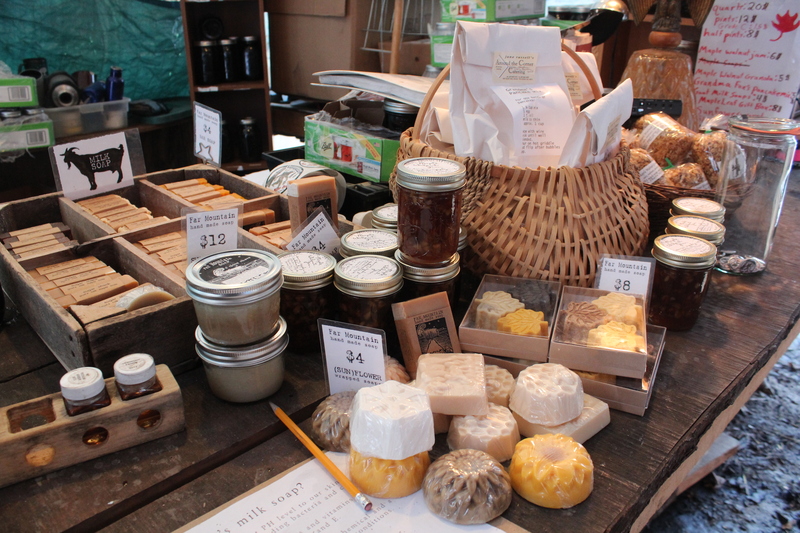 We were also very lucky to have a large selection of goat milk soaps for sale from neighbor Susan Verberg of Farm Mountain Soaps http://farmountainfarm.blogspot.com/ including sugarshack soap with maple sand from our 2012 year. My aunt Noreen Whitney of Nordic Farms http://www.nordicfarmjams.com/ sent along some maple walnut jams and mom rounded out our display with Grandma Fox’s pancake mix. Saturday night I was joined by a small but jolly contingent of partygoers. They were treated sweet steam and a warm fire while sipping hot sap beverages and swapping tales. I whipped up one of my wood-fired pizzas in the fire box for a snack. I was happy to host a crowd of foodies including Heather Sanford of the Piggery Butcher Shop http://www.thepiggery.net/pigblog/ for the first time. She has been very supportive over the years and provides shelf space at the butcher shop for Sapsquatch products. Our landlords and my uncle/aunt, Steven and Stephanie Holzbaur drove a crowd of folks down in the MuleSteven down the icy and muddy trail. Steven is co-creator and manager of the Finger Lakes Fresh Food Hub http://www.fingerlakesfresh.com/in Groton and his wife Stephanie is owner of Serendipity Catering http://serendipitycatering.biz/ . Mecklenberg neighbors Heather Christ Hallagan and husband Jake came back for a second visit of the day; Heather is an events planner from Gather https://www.facebook.com/pages/Gather/221528071219172 . 5th year Saspquatch alumn, Thomas Eisman from Six Circles Farm http://www.sixcirclesfarm.com/ was there as always and he kept us company and talked fruit until after midnight. I pulled an all-nighter with the help of long-time Sapsquatcher Travis and over the course of the weekend, we produced almost 20 gallons of fresh syrup. While the weather report looks good for everyone who has been complaining about this winter, it looks like maple season could be wrapping up early next week, so if you were thinking about paying a visit, this weekend’s maple festivities may be your last chance for 2014. Even though the season has been short, it has been sweet, and I predict we will make up for lost time this week and produce a total seasons yield just below or on par with last season’s first 100 gallon year. Hope to see you during the last two days of NY Maple weekend on Mark 29-30 when you can expect food, fun and temps in the high 40’s. Maple season is getting off to a late start this year just in time for the celebration of New York State’s Maple Weekends. The statewide festival is sponsored by the New York State Maple Producers Association and is now in its 15th year. 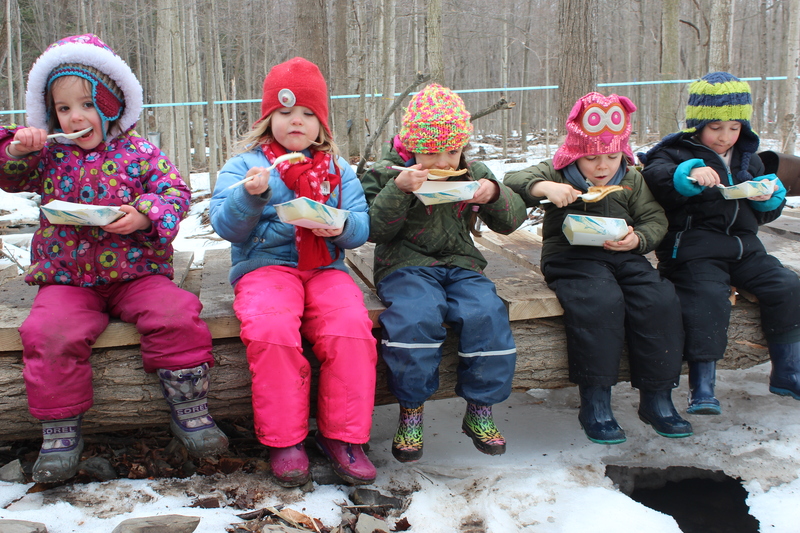 Association and independent producers will be opening their sugarhouses and sugar bushes to the public for two weekends of education, family fun and of course, pancakes. Sapsquatch Maple has been hosting on-farm events during Maple Weekend for 6 of the 7 years of operation. 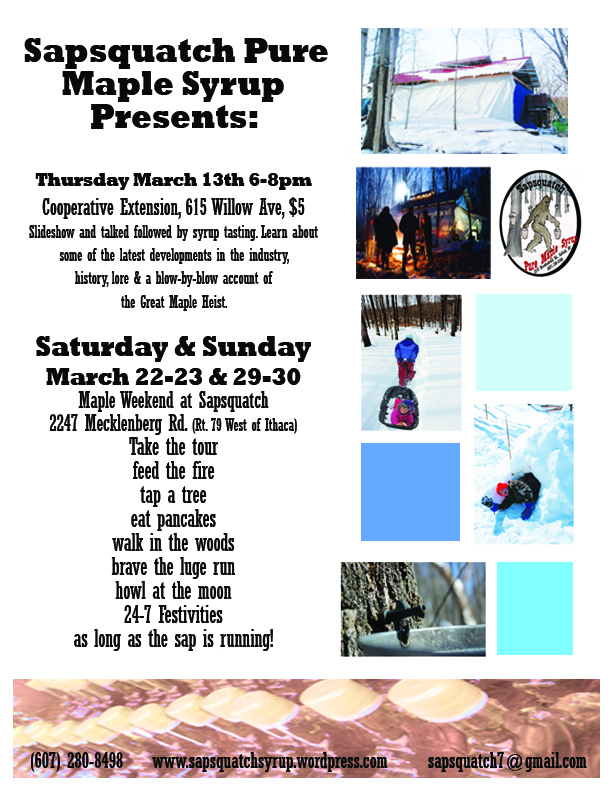 On March 22-23 and 29-30 from 10-5pm all four days, Sapsquatch will again open up the sugarhouse for sugaring tours, production demonstration, food, hiking and sledding. Tours will be led by youth from Enfield’s after school program who have been visiting, working and learning at the Sapsquatch Sugarbush every Thursday since late January. Sugarmaker and founder, Josh Dolan will be running the evaporator and providing an overview of maple production and on-site operations. Josh’s mom and area caterer Jane Russell will be cooking up pancakes and maple sausage. Guests will be able to sample syrup produced this year. The sugarhouse is located on Mecklenburg Rd. (Rt. 79) west of Ithaca at 2247 just over ½ mile on the left past the blinking light, or on the right just after the intersection of Rothermitch and Podunk Rds if you are coming from the Watkins Glen area. Sapsquatch has been offering CSA shares for the last 3 years, and sales are booming this year. This has enabled this small-scale wood fired boiling operation to grow and succeed in an industry dominated by large-scale highly technological producers. The community supported sugaring model is beneficial to the farm and has provided important start-up capital at the beginning of the season and countless hours of volunteer labor on the farm. Work traders get valuable hands-on experience and get to see where there food comes from. Community support has enabled Sapsquatch to provide hands-on education to community groups, after school programs, adult English-as-a-second language students and play host to high school students from Brooklyn. 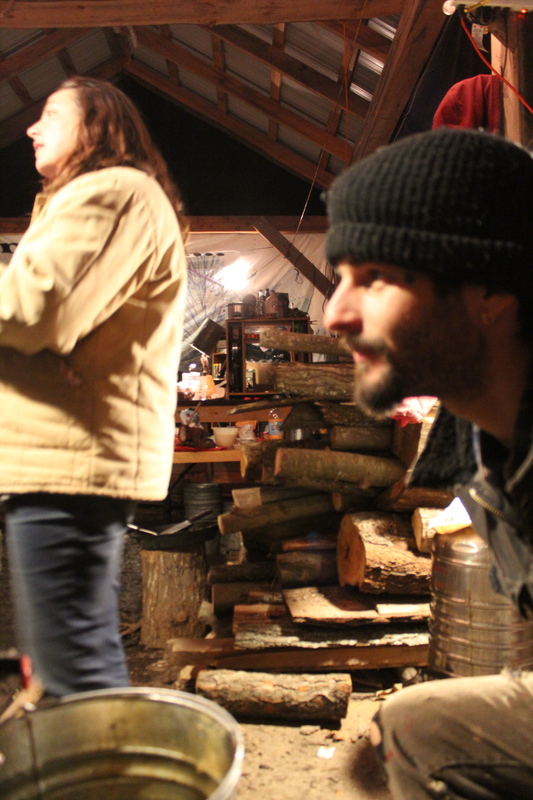 Sugarmaker Josh envisions a rapidly growing local industry, networks of local producers sharing resources and the future development of cooperative sugaring businesses and cooperatively run sugarhouse. He views the educational aspect of the farm as a crucial part of developing the industry in the area and training the next generation of young sugarmakers. It's maple syrup time, so why the smell of french fries? The science of syrup: Why the different tastes? Ramps: When is local not Kosher? Thomas Jefferson: Inventor of Chicken and Waffles? Sapsquatch strikes in New Brunswick!